Kate Gibbs, deputy director of the Burlington County Board of Chosen Freeholders presents a proclamation to representatives of the Burlington-Camden County Regional Chronic Disease Coalition. 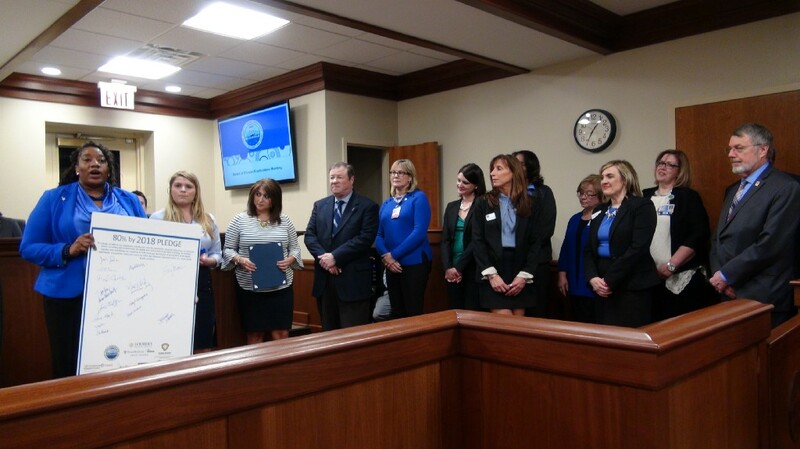 The Burlington County Board of Chosen Freeholders has announced that the freeholders and county have joined forces with the Burlington-Camden County Regional Chronic Disease Coalition and pledged to help increase colorectal cancer screening rates by supporting the “80% by 2018” initiative. According to a release from the county, Colorectal cancer screening has been proven to save lives. Colorectal cancer is the nation’s second-leading cause of cancer-related deaths; however, it is one of only a few cancers that can be prevented. Through proper colorectal cancer screening, doctors can find and remove hidden growths (called “polyps”) in the colon, before they become cancerous. Removing polyps can prevent cancer altogether. “80% by 2018” is a National Colorectal Cancer Roundtable (NCCRT) initiative in which more than five hundred organizations have committed to substantially reducing colorectal cancer as a major public health problem and are working toward the shared goal of 80 percent of adults aged 50 and older being regularly screened for colorectal cancer by 2018. “Colorectal cancer is a major public health problem, and adults age 50 and older should be regularly screened for it, but many people aren’t getting tested because they don’t believe they are at risk,” Garganio said. According to the county, while colorectal cancer incidence rates have dropped 30 percent in the U.S. during the last 10 years among adults 50 and older, it is still the second leading cause of cancer death in the U.S., despite being highly preventable, detectable and treatable. In 2015 in the U.S., 132,700 cases of colorectal cancer were diagnosed. Part of the “80% by 2018” goal is to leverage the energy of multiple and diverse partners to empower communities, patients, providers to increase screening rates. The “80% by 2018” initiative consists of health care providers, health systems, communities, businesses, community health centers, government, non-profit organizations and patient advocacy groups who are committed to getting more people screened for colorectal cancer to prevent more cancers and save lives.